This look was created using the Lorac Mint Edition Collection I bought a few months back. I used all of the colours wet so that they were extra bright! 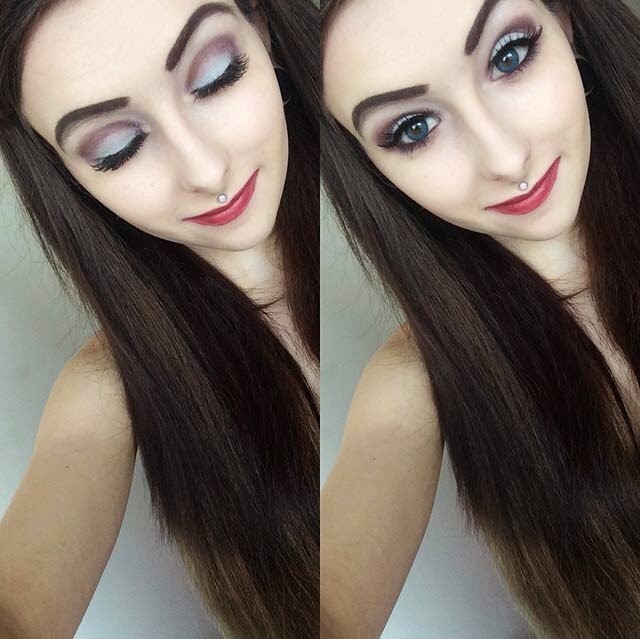 I first applied the lightest colour all over my eyelids up to my eyebrows as a nice base. I then took the blue colour and applied it all over my eyelid. After that I took the purple colour and blended it into my crease. From there, there was a lot of blending and perfecting. I used my iPhone camera so the quality isn't the greatest and doesn't show the gradient as well as it actually was! I lined my lips with Revlon's lip liner in Ravenous and then applied the darkest colour from my AW03 palette all over with a lip brush for perfect precision. My eyebrows are as purr usual Anastasia Beverly Hills Dip Brow Pomade! Also wearing my new Fresh Looks coloured prescription contacts in Brilliant Blue!